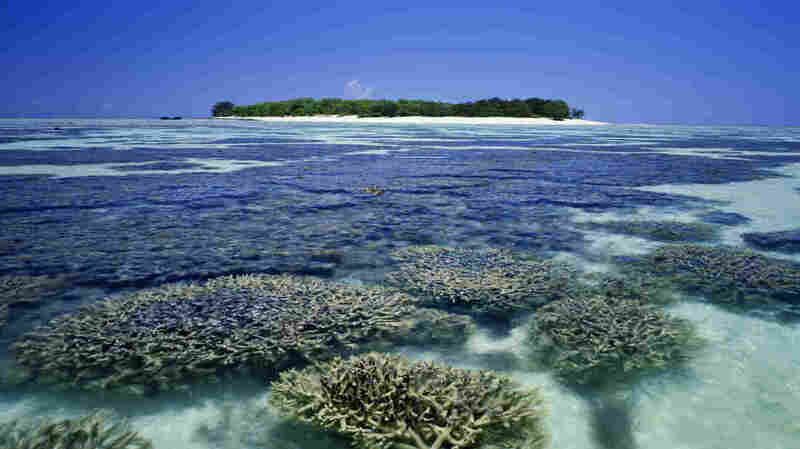 Australia's Heron Island: A Canary In The Coal Mine For Coral Reefs? : The Two-Way The tropical island set in turquoise water just off the Great Barrier Reef is the site of an experiment to see what will happen to coral reefs as the ocean absorbs ever more of the carbon dioxide and heat we've added to our planet's thin skin. The results weren't so pretty. That's a tough sentence to write because the setting for this unhappy discovery is spectacular. Heron Island sits in tropical turquoise waters about 25 miles off the northeast coast of Australia. It's an island on the far southern end of the Great Barrier Reef — one of our planet's most dramatic natural features, akin to the tropical rain forests, only submerged. The low vegetation is filled with fearless and noisy sea birds. Snorkelers watch as graceful turtles swim toward the coral sand beaches — it's egg-laying time for them. Within earshot of the lapping waves is a modern scientific laboratory, the Heron Island Research Station. And that's where the topic turns from tropical relaxation to a nagging anxiety about the future of the world's coral reefs. Sophie Dove, from the University of Queensland in St. Lucia, has spent the past couple of years crafting an experiment to see what will happen to coral reefs as the ocean absorbs ever more of the carbon dioxide and heat we've added to our planet's thin skin. She's gathered a variety of coral species from the island's nearby reef and placed them in tanks that look like a cross between a kettle drum and an oversized plant pot. Into one set of these pots, she has put seawater at the reef's current temperature and carbon dioxide concentration. A second set circulates water that's somewhat cooler and has less carbon dioxide — conditions the reef experienced 100 years ago, before we started burning fossil fuels and pouring huge amounts of carbon dioxide into the atmosphere. Two final sets of tanks hold water that's warmer and contains far more carbon dioxide than the oceans absorb today. These are glimpses into our perhaps not-so-distant future. 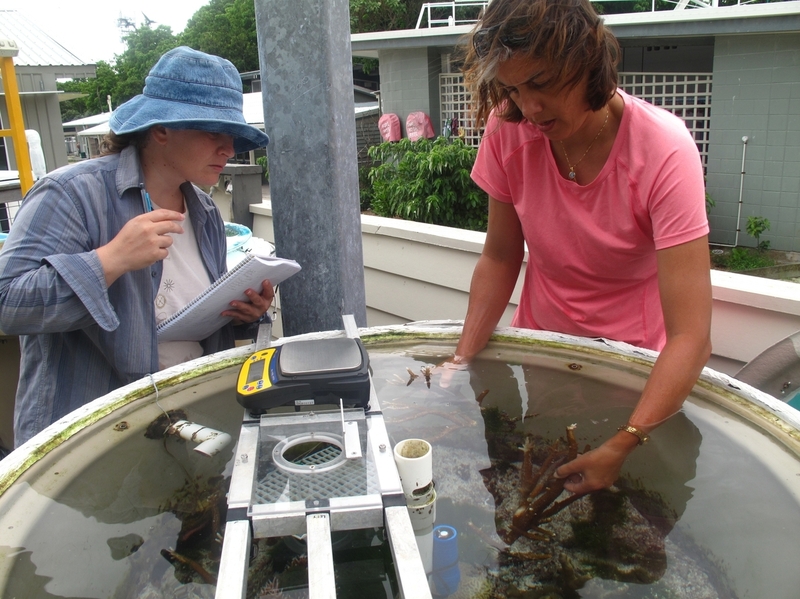 Sophie Dove (right) and Annamieke Van Den Heuvel of the Coral Reef Ecosystems Laboratory at the University of Queensland, St. Lucia, check on part of an experiment on the effects of water temperature and carbon dioxide levels on coral reefs. Carbon dioxide matters to coral because when it soaks into sea water, it turns into carbonic acid. We've put so much carbon dioxide into the atmosphere that the oceans are already 30 percent more acidic now than they were before the Industrial Revolution. And as acidity increases, it becomes harder and harder for corals to build their calcium structures. Eventually, corals will need to expend a lot of energy just to prevent their skeletons from dissolving into seawater. Heat is also a problem. Most of the additional heat that Earth has absorbed as a result of the enhanced greenhouse effect has in fact been soaked up by the world's oceans. In fact, we're really experiencing ocean warming more than global warming. Dove opens up the first of these tanks — present-day conditions. The corals look like they came from a picture book of life on the reef. The second tank, pre-industrial, looks about the same, though Dove says those corals are actually growing faster and are healthier than those growing in modern-day seawater. The third and fourth tanks are the shockers. Most of the corals have died in this "future" world. A gelatinous black slime floats across the top of one tank. Corals still hanging in there have lost the colorful organisms that live inside those calcium skeletons, so they are bleached white. Scientists have been worrying about this for well over a decade. It's taking some time for the experimental evidence to catch up with the basic chemistry, which strongly suggests that many marine animals that build shells from calcium are going to have it rough as carbon dioxide builds up in the water. Add heat, and the situation for these corals is grim. That's not the end of the story, thankfully. This experiment offers a glimpse at our most likely future, but it's not the only possible path. Carbon dioxide levels and sea temperatures depend on what humanity does over the coming decades.